Rosa Sound provides an overview of tools that illustrate as widely as possible the different aspects of plucked stringed instruments, with historical and biographical notes relating to the major traditions of violin making and teachers more representative. The starting point is Turin, where he worked a leading school of violin making, which brought fame in the first place the Guadagnini family together with Godone and Torchio. A second area is reserved for those artisans from the French town of Mirecourt that, again in Turin, were active: Pillement, Denis, Noiriel-Lacaille, Calot. The century-old tradition of cultural exchange between Piedmont and France justifies, or rather imposes an overview of the best instruments of violin making in France. Here, then, among those chosen, the proud products of Voboam Alexander (guitar oldest that we know of that maker, exhibited for the first time to the public), and Lacote. About these tools, or other similar instrument makers sounded the same Francesco Corbetta, the most famous guitarist of the seventeenth and Fernando Sor, the supreme guitarist-composer of the nineteenth century. A particular guitar, always French author, is that the Piedmont guitarist Francesco Molino devised drawing inspiration from the features of the violin, guitar rare that John Accornero has returned to its ancient splendor recently enough to be used for the recording of the Concerto for guitar and orchestra of the same Molino. At the Neapolitan school of the dynasties of Filano, Marc and Fabricatore you get through the mandolin and the guitar that Pasquale Vinaccia built for Queen Margherita of Savoy. Treating the choice of instruments of an exhibition like this post and the time itself prestigious and delicate; prestigious for those that are scientific and historical content of an initiative like this, delicate at the same time because you have to meet and exceed the needs of experts, enthusiasts but also to who view the exhibition for simple curiosity. With this in mind I thought it useful to make a choice of tools that illustrate in a more broad as possible the different aspects of plucked stringed instruments, adding to the path of the visitors with historical and biographical notes relating to the major traditions of violin making and teachers more representative. For me it was an extremely useful, because it allowed me to develop studies that I am currently conducting in this area; studies that will be collected in a large volume dedicated to the guitar, made thanks to the intervention and collaboration of Ivan Epicoc and Eraldo Guerci. The catalog of this exhibition is a sort of anticipation of the book, which will be published by Editions Il Salabue. 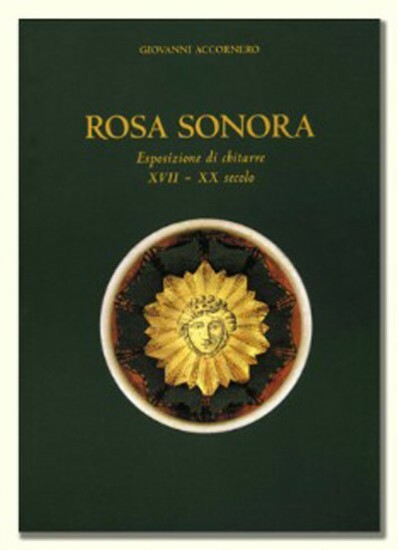 The catalog is presented in conjunction with the book by Mario Dell'Ara "Rosa Sonora", entirely dedicated to the history of the guitar and its builders. The quality of this work and the reputation of serious musicologist and musician Dell'Ara make me feel particularly honored to have been part of an initiative whose importance and destined to extend well beyond the duration of the exhibition. Even for that I thank prof. Michelangelo Alocco, organizer of the event, which gave me the chance to confront scholars such authority and to take part in a project great skill and meticulousness worked at my side to the restoration of many of the instruments exhibited thus allowing to admire them and appreciate to their original beauty.